The International English Language Testing System (IELTS) Academic Writing examination is designed to gauge a candidate’s skills with hearing and understanding, comprehending written words, writing and talking in English. More than 6000 English schools, associations and groups around the world use this test as a legitimate marker of a person’s English language skills. The test has been created so that it evaluates an assortment of skill levels ranging from non-user to proficient. Listening – This part of the test has four sections. It contains 40 questions, and candidates are given 30 minutes to finish. Academic Reading – This part of the test has three sections. It contains 40 questions, and candidates have one hour to finish. Academic Writing – There are two tasks to complete, each of which should be between 150-250 words. Candidates have one hour to finish. Speaking – This section will last 11-14 minutes. 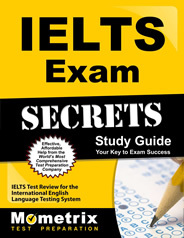 The IELTS exam is available in pencil and paper or computer-based form, depending on the location. The tests are the same in terms of difficulty level. All speaking exams are done person to person. The tests are scored with a 9-band scale. Candidates will receive the results no more than 13 days from finishing the exam. Ace the IELTS test using our IELTS exam study guide with practice questions. 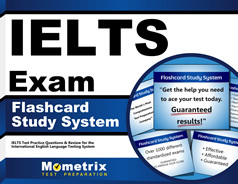 Quickly Solve Difficult IELTS Test Questions with the IELTS Flashcard Study System.